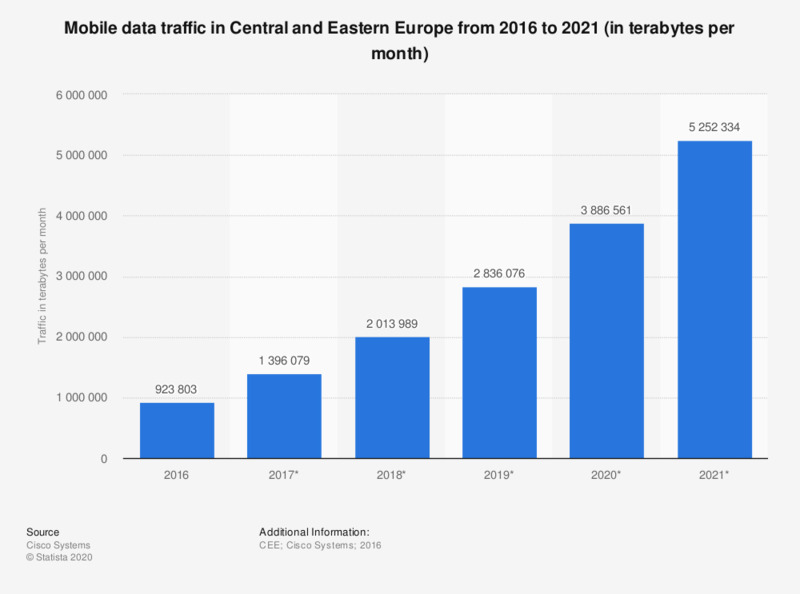 This statistic gives information on the mobile data traffic in Central and Eastern Europe in 2016 with projections until 2021. In 2016, mobile data traffic in Central and Eastern Europe amounted to 923,803 terabytes per month. In 2021, Central and Eastern European traffic from mobile devices such as smartphones, laptops, tables, M2M connections and non-smartphones is projected to reach 5,252,334 terabytes per month. The projected compound annual growth rate (CAGR) amounts to 42 percent. Includes data, file sharing, video and M2M appplications. Includes nonsmartphones, smartphones, laptops, tablets, M2M and other portable devices. Everything On "Mobile internet usage in the European Union (EU)" in One Document: Edited and Divided into Handy Chapters. Including Detailed References.